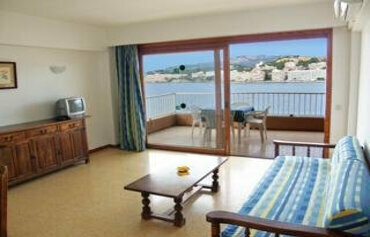 When comes to views across Santa Ponsa Bay, the 2 star Portofino Sorrento Apartments take some beating. Located in an elevated position and just a few steps from the beach, this value for money self catering complex is a favourite with families and young people. The pool area takes centre stage during the daytime. The freeform pool has a kids section and is lined with sun terraces and sun beds. No need to wander too far from your spot in the sun for refreshments, there is a poolside snack bar close by. If you prefer to feel the sand between your toes, you are just a hop, skip and jump from the beach. The apartments themselves are spacious and come complete with a balcony and kitchen facilities. After a long day on the beach or by the pool, head indoors to enjoy a drink in the friendly lounge bar. 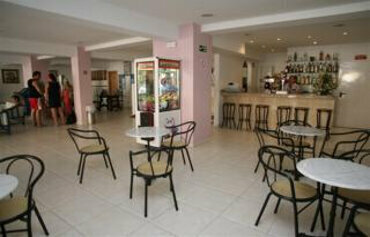 The many shops, bars and restaurant in the centre of Santa Ponsa are just a ten minute walk from the apartments. Discover why the Portofino Sorrento Apartments are a popular choice for self catering holidays in Santa Ponsa. The Portofino Sorrento Apartments have all the facilities you would expect from 2 star apartments in Majorca. Highlights include: an outdoor swimming pool with kids section, sun terraces, sun beds and parasols, a 24 hour reception, two pool tables, gymnasium, lounge bar and a pool bar (high season). The Portofino Sorrento Apartments consist of 119 one and two bedroom apartments spread across two buildings. All apartments have bathroom with shower and WC, kitchenette, TV and a balcony or terrace. Air conditioning, safe and WiFi are also available but incur an additional cost. During the summer months, the poolside bar offers snacks and drinks during the daytime. The indoor lounge bar is the place for cocktails, wines and beer, with pool tables, video games and TV to enjoy too. 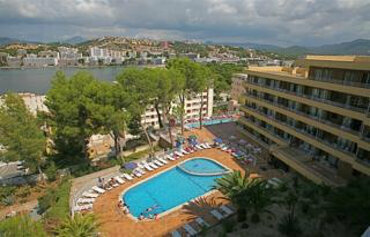 The Portofino Sorrento Apartments are located above the beach in Santa Ponsa. A 10minute walk will take you to the resort centre and Palma Airport is 40kms away. NB: here are a number of steps to negotiate around the complex.